As a newcomer to the Tank Girl series, I was eager to dive into its wacky and hyper-violent world, but was ultimately put off by the ridiculousness of it feeling a bit too detached from anything relatable. 116 pages later, I’m still trying to figure out exactly what 21st Century Tank Girl is about. It’s a comic jam-packed with frenetic energy and bizarre violence, a short story collection occasionally stepping into insightful territory, and an ambitious project running the gamut from entertaining and well-illustrated comic to a weird mashup of storytelling styles combining mediocre artwork and the esoteric humor of Adult Swim. At the center of it is Tank Girl, a cigarette-chomping badass with a haircut not unlike a Barbie belonging to a child with a scissor obsession. She’s brash, crude, and obscenely violent, but we also see glimpses of her humanity and compassion in moments when she helps her friends and fights for justice in unorthodox ways. She’s friends with Jet Girl, the stoner who is also inexplicably a jet pilot, a girl named Barney with no particularly discernible features, and an anthropomorphized Kangaroo named Booga with whom she is both a partner and lover. There are no consistent rules with which to anchor oneself in Tank Girl. Booga is seemingly the only intelligent and human-like animal in this entire world. Tank Girl owns a tank (obviously) and sometimes engages in battles with other tanks, but she’s not explicitly part of the military in any capacity beyond occasionally wearing fatigues. The adventures these four go on are random, lacking any sort of connective labels or tissue. They’re not a group of miscreant anti-heroes saving the day, not some kind of twisted A-Team going around and doing good for the people. They’re just a bunch of weirdly violent characters who wind up in situations lacking any narrative cohesion. This prevented me from ever feeling connected with Tank Girl and her gang. Without any consistency to better understand a character’s motivations, everything is all over the place and randomized, leaving me feeling a bit like an outsider never allowed to truly step in. The strange mix of storytelling did nothing to help this. Normally, I enjoy a blend of narrative styles, but when added to the already confusing world and characters, jumping from a traditional comic-style one-off to a full-on short story amplified how jarring and disjointed this entire book is. 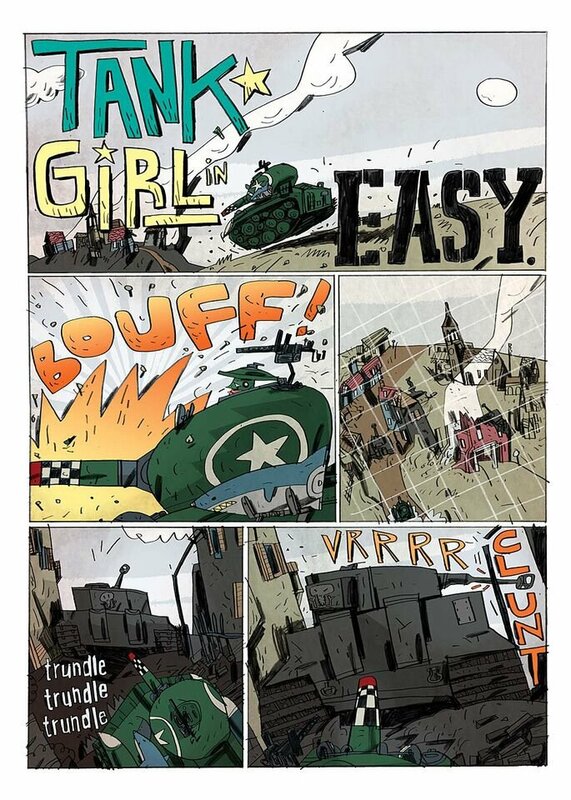 The inclusion of multiple artists in a comic volume isn’t a new thing, but it further compounds the weird connectivity within Tank Girl Volume 1. There were a handful of styles that I felt really conveyed the wackiness of Tank Girl well, but it was coupled with other styles best described as quasi-abstract art I not only didn’t like, but also felt didn’t do anything to help convey the story visually. It’s unfortunate, because when Tank Girl harnesses its zaniness and adopts some form of cohesiveness, it’s genuinely enjoyable. 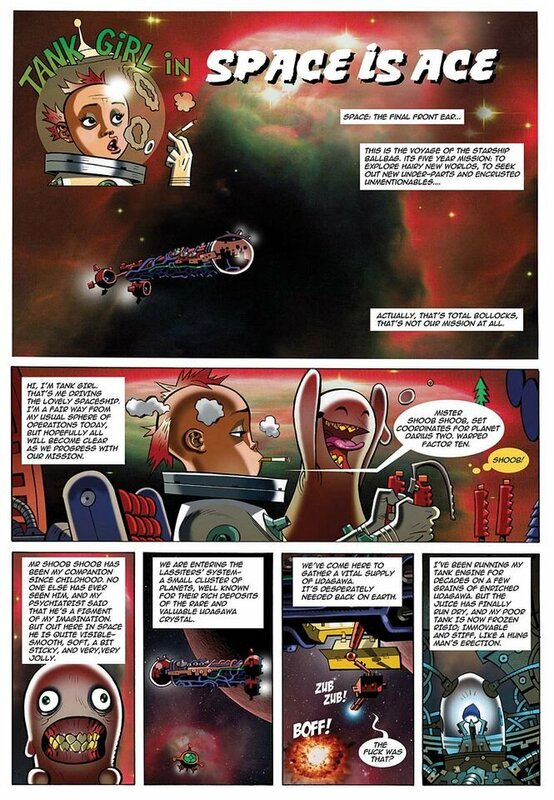 There’s a vignette in which Booga, Tank Girl, and Jet Girl deliver a car to a customer while being ambushed by thugs. The art is bold and brilliant, bringing energy to the writing and making the entire scene electric. The comedic thru line of this scene sees the car being systematically destroyed until it’s nothing more than the chassis and vital components upon delivery. Watching the car fall apart, seeing characters leaping from one vehicle to another, and even going on a psychedelic near-death journey with Jet Girl was all extremely fun and, for a brief moment, gave me some solid understanding of what Tank Girl is. This is the weirdness that could make Tank Girl into a brilliant and violently comedic romp through the Outback. But before its charm can be completely understood, there needs to be a baseline amount of cohesion to craft it into something feeling more substantial than a series of wacky moments haphazardly strung together. At the center of it is Tank Girl, a cigarette-chomping badass with a haircut not unlike a Barbie belonging to a child with a scissor obsession.